Hello Dears!! Todays is the 14th Battle of this Challenge and is a battle of Inspiration between Childhood vs. Future. I've chosen Childhood! I was a child during the 80's and back then graffiti was a big trend, specially among some groups of young people. So I've decided to do graffiti nails! 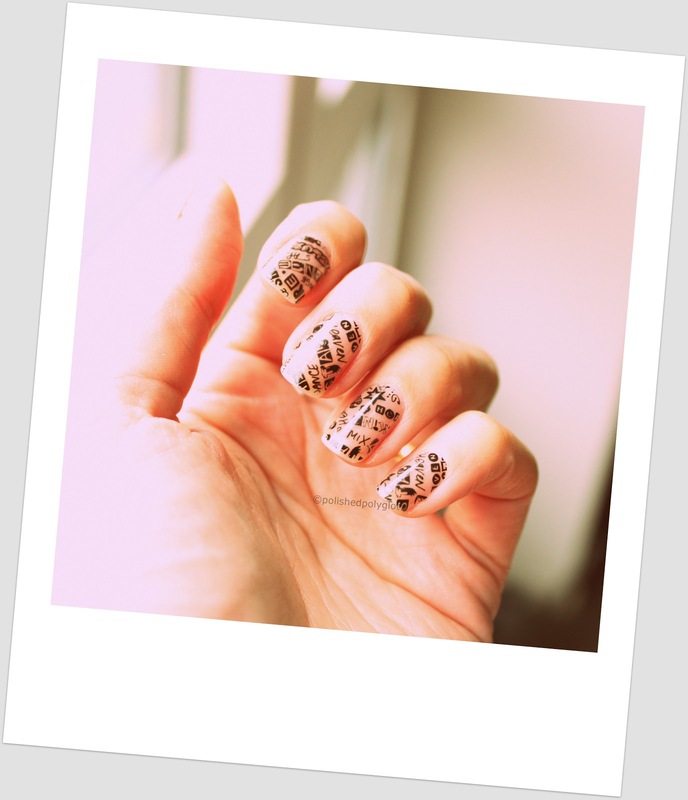 Of course do not expect an spectacular free handed nail art, but just the perfect occasion to wear my Essence gel like nail stickers in 03 Berlin's most wanted. New Look for Polished Polyglot! Hello my darlings? How are you doing today? Isn't it crazy we arrive already to the end of January? Where have this month gone? Firstly, I'd like to remind you of my GIVEAWAY which is still going for one more week, so if you haven't entered yet, what are you waiting for??!! Organizing this giveaway was much fun to me, so you can bet it won't be the last time! This was also a way for me to have an important feedback from readers as what they think about my blog. I'm most interested in knowing your honest opinion. BUT, of course, I can't change everything of everything, because it would stop being MY blog, wouldn't it? In one thing I agree with a lot of you who had commented: the looks did not completely satisfied me. As you may have noticed (well, not if it's the first time you visit the blog!) I've introduced a few changes to the way my blog looks like. I've been intending to do that from the beginning, but I was a bit lazy and just picked one standard layout when I started the blog. I have another manicure I think it would be fun wearing for Carnival, just because it reminds me a lot to the confetti used during the parades! Hello my darling readers! We start a new week so today I have new things to show you! This is about the new Essence Limited Edition for Valentine's day and it's named Hugs & kisses. This is a collection with many, many nail polishes, of which I've picked none! It was so sad to see the display completely ravaged! but only the nail polish was missing! well, if you want to see what the whole collection looks like click here, you might be luckier than me! Hello my dears! How was your weekend? In 2.5 weeks time is Valentine's Day and I thought it was time for another idea for a manicure dedicated to the lover's date. Last week I've showed you a Vintage Valentine's mani, which was grey and white, and maybe a little dull. To see my last week's Valentine's mani click here. You can Also check my Valentine's day Gallery on the dedicated page, just click on the tab under my Blog Header. So today, I thought it would have been a nice idea to brighten up the lover's day with some yellow nails! Hello my dear readers! Happy Friday to all!! Today I have for you the 13th Battle of this Challenge which is a battle of Inspiration! Inspired by a dress vs. shoes. So for me it had to be the dress! It's a quite simple wearable silk spring dress I bought last year for my son's baptism, but I love it very much and I decided I wanted to reproduce it on my nails. Hello my dear readers! Guess what I bring you today? Good news!!! Another LE from Catrice!! This time it's just a preview, I'd like to share with you what I've found on their site. All the info and pictures belong to Catrice website here. This collection will be available in few days, but launching dates may vary according to each country. 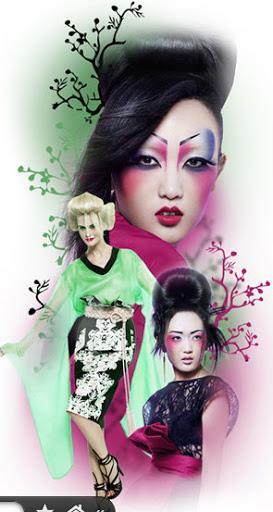 Widely popular on the international catwalks: the Asia trend, inspired by the Japanese Geisha look. Red lips and black eyeliner are absolutely essential for the silk kimonos, collarless jackets and spectacular footwear of this trend. What I'd like to show you today is my first Valentine's Day manicure of this year. It's a simple grey and white manicure with some vintage melancholic air. For this mani I used Essence Get Arty as a base, and stamped on it with white konad special polish using Konad plate m-65 for the roses pattern. Later on I stamped with konad red wine special polish and plate m2 the hearts with the Love inscription. One week ago I received the most awesome nailmail from my "Polish Fairy" Christine from Polished Marvels blog. No kidding! she sent me 5 fantastic nail polish that I'll be showing to you soon, but it wasn't only about polish, she included this fantastic blush from Essence Vintage District Limited Edition in 01 It's Popul-Art. This lady rocks! Hello lovelies! How was your weekend? Hope you had a great time and that you're starting the week in the best way. Today I decided it was time to put some motivation to my nail art. You know, December and the Holidays Season brought many excuses to do nail art, and since January began, all my nail art has been dedicated solely to the once per week challenge I'm in. So I thought I'm definitely one to need some excuse, and I found two very good excuses!! First Mardi Gras is on the 12th February this year and Valentine's Day is on the 14th February (that's every year), so I thought that would give me two wonderful excuses to do some crazy manicures and some girly manicures as well!! Hello everyone! How is your weekend so far? I hope you're enjoying it! Today I wanted to share with you one habit I've come to acquire with time and it is blotting paper. I've only used NYX regular blotting paper until now, and can't compare with other brands paper, so I would love to hear your comments on this. I think it was last year (correct me if I'm wrong) that NYX launched special treatment blotting paper, and I'm glad I finally decided to pick up these two. Hello my dears! Happy Friday!! How are you doing? Any interesting programs for the weekend? Today I have to show you the 12th battle of this challenge and it's all about cream vs. shimmer. I've chosen Essie Buttler Please! as a base because I wanted something really colourful and this is such a vibrant shade of blue, although it's not a traditional Essie creme, should I had gone for China Glaze For Audrey? I hesitated there. For the shimmery part I used two Max factor polishes: Meteorite (purple) and graffiti (teal), which I'll swatch for you soon. This is actually my post number 100!!!!!!! Can you believe that? it seems it was yesterday I started this blog and I've already posted 100 times! Day after day this blog is a source of fun and satisfaction and I would love it to continue that way. I am so lucky to have the most wonderful followers, faithful readers, nice and sweet enough to take their valuable time to read my craziness and comment on my redoubtable ideas. I enjoy each day receiving and answering your comments! You've spoiled me now and I wait for them each day! and it is only thanks to you if I made it to my n° 100 post! So as a way to say thank you I wanted to do my very first giveaway. I'm very excited about it, though it might not seem a big deal, I surely had fun organizing it. I've chosen to include items of the current limited editions of Essence Snow Jam & Vintage District. Hello my dears! How are you all doing? Today I have for you a NOTD OPI Tomorrow Never Dies from the Skyfall Collection. It wasn't in my plans to wear this colour, but I haven't tried this one yet and It looked so awesome in the bottle I couldn't resist! It's been so long since I've posted my first Layering of the Week, that I decided it was time to bring it back! Today I have to show you a pretty combo: NYX Under the moon over China Glaze Frosty. I bought Under the moon with a bunch of other NYX nail polish Glitter like a month ago (of which I've done a post here), and haven't had the occasion to share it with you until now. Hello my dears! How was your weekend so far? We have many things going on with our new home, and I like that, so I've been enjoying my weekend a lot! 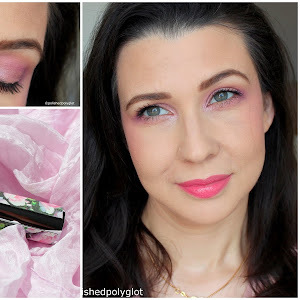 Today I want to show you what I purchased during the exceptional sale NYX cosmetics Switzerland was having during the month of October (gosh, can't believe I'm so late with this post!). It is a Nail Art Polish Army!! lol. I hope you're doing well, any nice program for the weekend? 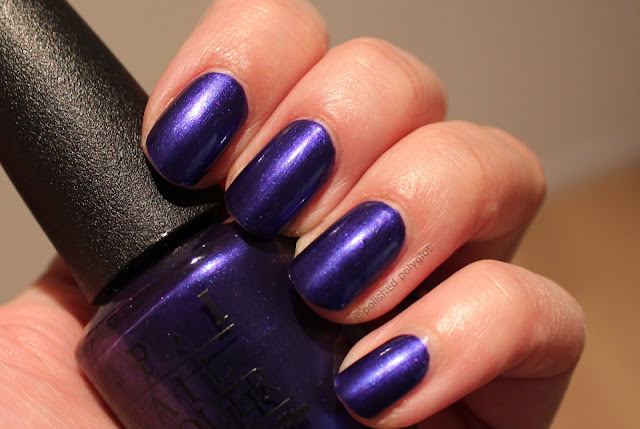 Today I have for you a new shade called Life is a Freeride, from the latest Essence LE Snow Jam. 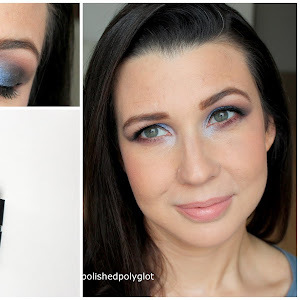 This is a gorgeous and intensely pigmented teal shimmer, that is a one coater! It is the thick side, but it applies nicely and it goes were you want it. For the picture I'm wearing two coats with Seche vite on top, and I had a little shrinking :( that is what you see and not tip wear. Today I bring you the 11th Battle of this challenge and it is Glitter vs. Bar Glitter. I haven't done any nail art today, I thought I would get the easy way and wear a gorgeous polish from China Glaze Worlds Away collection: Get carried away. This polish combines small round glitter, hexagonal silver and red glitter, and black matte bar glitter on a jelly black base. I don't own any bar glitter polish on its own, because I'm not very fond of bar glitter. Hi lovelies! How are you doing? I'm slowly trying to get on the routine again and to take also my blog back on the track of posting more frequently. I don't know if I'll make it because as I've already mentioned, my nails are in a quite poor shape. That's why I'm posting today about the thing I love the most cosmetic wise after nail polish and it is makeup sets!! (well highlighters is a close runner too, lol). Today is all about a wonderful NYX palette that came out last year sometime around spring, and it's called "Be free". Hello Dears! I hope you're enjoying your weekend! We are finally back home and I'm starting to go gently back to the "normal" life. I've just unpacked and we have now a mountain of laundry to be done, lol. I have not done my nails a lot during the holidays, only for Christmas and New Year's eve. In fact my nails are in a pretty bad shape. I don't know which could be the reason, but they keep breaking and peeling. I thought I might be lacking some vitamins... or calcium.. well, not sure. It could be also my mother does not own a dish washer, so I've been washing up more than usual and that affects my hands and nails. Today I wanted to share with you one of my favourite polishes, Chanel Black Pearl. I know when this polish went out, there were many contrasted opinions about it, and many people thought it was not big deal. But I love it! I find it very sophisticated and quite neutral, and it reminds me a lot of black pearls, which I love. What do you think about it? 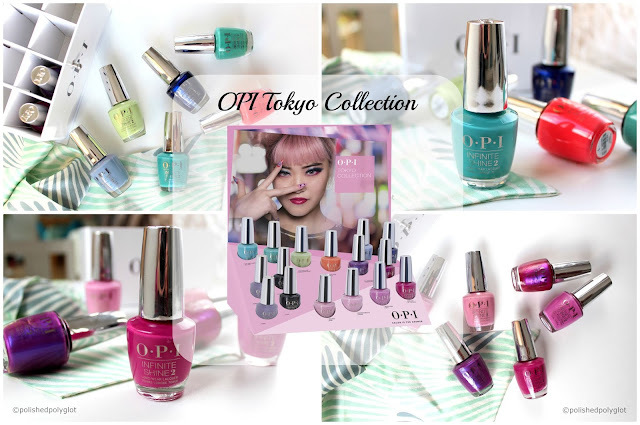 Have you got this colour? Chanel Malice - A Return. Hi Lovelies! How is your weekend going? I bet you're enjoying it! Last year Catrice had a bunch of new shades in its main nail polish line, of which I've picked four: two of the Brushed Metal effect and two blues. I also picked a raspberry red, a multichrome which is similar to Chanel Peridot and two taupe-y mushroom shades, which are in fact named the same (?) ! but those are not "new". Hi my dear readers, I hope you've all begun the 2013 with peace and happiness! I want to apologize to all my readers because I haven't been posting a lot, nor reading or commenting other blogs while on vacation in my home country. The past 3 weeks have been very nice and unusual for the three of us, we've had the chance to share with the family and friends, and also to relax and charge our batteries with good vibes! Today we are heading back home. As usual goodbyes will be hard, and the return trip will seem eternal :( Once home we have so many things to do!! these year will be very busy, and I'm happy it is the case. We'll go back to the responsibilities and the routine, but I'll be also able to dedicate a little more time to blogging. I hope you're all doing great, wishing you all the best!